If you want to get a steady stream of free visitors to your site from search engines such as Google and Bing, then you will need to make sure that your content is optimized for those search engines. However, as well as ensuring that your content is Search Engine Optimized (SEO), it’s also vital that the underlying structure of your website is also search engine friendly. If you are using WordPress as the publishing platform for your content, then a big part of your SEO duties are taken care for you already. While this means WordPress users are usually starting out on the right footing when it comes to building an SEO friendly website, there is another issue they need to consider. With content playing such a massive role in how your site is ranked in the search engines, the role the design of a site can often be overlooked. In this article we will share you with some tips on how to pick an SEO friendly WordPress theme for your website, and also make sure your choice is not doing anything to negatively affect your sites position in the ranks. Before we get to the tips on choosing an SEO friendly WordPress theme, it’s worthwhile highlighting why WordPress is a good choice from an SEO perspective, just in case you aren’t entirely sold on this platform or are still shopping around. This is thanks in part to the relatively clean code that WordPress is built with. The lack of bloat, or inefficient code, which can sometimes occur with hand built websites, or those created with a visual editor, keeps file sizes down. This helps them to load faster, which is something that is looked upon favorably by the search engines. Another reason why using a self-hosted installation of WordPress has its advantages from an SEO perspective are the available plugins which can help optimize a website. The two most popular options are the free All in One SEO Pack, with over 18 million downloads, and the higher rated, WordPress SEO plugin by Yoast, another free plugin, which has only been downloaded 10 million times. Both of these plugins can be installed directly from within your WordPress admin dashboard, and adding one of them on your site is highly recommended. A further reason why using WordPress has its SEO benefits is the sheer number of users who have adopted this platform. This means there is plenty of information and advice out there on how best to setup and configure your site in order to ensure is it as SEO friendly as possible. While some of this content should be taken with a pinch of salt, there aren’t many other publishing platforms that have had guides like this written for them, and whole industries built up around optimizing WordPress sites. However, despite all this SEO goodness at your disposal as a WordPress user, you can still cancel out some of these benefits by choosing a WordPress theme that hasn’t been built with the search engines in mind. To help you avoid making this mistake, here are some tips on choosing an SEO friendly WordPress theme. With so many themes available, it can be hard to know which features are important and which are not. While this list doesn’t cover all the desirable features you should be looking for in a WordPress theme, it does give you some points to consider to ensure your theme is as search engine friendly as possible. A responsive WordPress theme is one with a fluid layout that re-sizes and rearranges page elements to offer better usability for visitors viewing your content on smaller screen devices, such as tablets and smartphones. With so many internet users now browsing the web on a mobile device, this is a feature all theme designers should be including in their products. However, from an SEO standpoint, failure to ensure that your site is mobile friendly could have a negative impact on its position in the search engine results pages (SERPS), which in turn can result in less traffic to your site, and less customers or clients. In 2013, Google announced that sites that aren’t mobile-friendly could be demoted in their listings. As making use of a responsive is a cost effective and easy to implement way of ensuring your site is mobile friendly, looking for a theme with this feature comes highly recommended. With so many of the best starter themes for WordPress being responsive, there really is no excuse for not making use of this type of layout. With mobile internet usage showing no signs of slowing down using a theme with a fully responsive design is not only good SEO practice but essential usability practice too. Homepage sliders were undoubtedly one of the big web design trends of 2013. Although the backlash against them is well underway, they are still a common fixture on the most popular premium themes available today. However, as it turns out, these content sliders are not only bad for usability and conversions, but also bad for SEO. One of the main SEO issues that can arise when using these homepage carousels is the use of multiple H1 headings per page, as opposed to the use of just one heading of this type per page, which is common SEO best practice. In addition to this, these sliders can also slow down the page due to their drain on resources. This increase in page load times not only repels visitors, but it also doesn’t go down well with the search engines, which use site speed as part of their ranking criteria for a website. There are many reasons to avoid sliders, especially if you are looking for an SEO-friendly WordPress theme. Choosing a theme that makes use of schema.org markup can be beneficial from an SEO perspective. It can also help increase the number of visitors who click through to your website from the search engine results pages so it is definitely worth adding to your theme buying checklist. By using this markup, publishers can include documentation in their pages that can help the search engines better understand that content. This in turn can lead to a more relevant classification in their listings. While HTML tags such as <title> and <description> are a start, you can do a lot more with schema.org markup. You have probably already seen this type of markup in action already. A popular example of rich snippets that many sites are now using is the author photo that is displayed next to the site description in Google. This site has some good examples of sites using rich snippets which should give you some inspiration on how you can use this effect on your website. Other uses include links to the author’s social media profile, star ratings, product information, event details, location, video thumbnails, and much more. This information can also be displayed on social networks such as Twitter, Facebook and Pinterest, making your content look even more enticing when shared socially. While there are plugins that can add schema.org markup to your WordPress site, theme developers can also include it in their creations. Yoast, the team behind the aforementioned WordPress SEO plugin, has recently moved into the WordPress theme market with their own range of designs. While this doesn’t mean you should rush out and buy one of their themes in order to gain a better position in the SERPS, it is still worth shopping around for a developer who knows about the latest SEO best practices and can incorporate them into their theme designs. This is likely to take the form of clean, optimized code, a lack of features which can be detrimental to usability, and a responsive mobile friendly layout. While it’s not possible to verify the SEO knowledge of every theme designer, if you get a sense that a developer knows their stuff, then it can be a point in their favor when comparing the themes in your shortlist. Although the previously mentioned SEO plugins tend to work with most WordPress themes if not all, some themes go that extra mile to ensure maximum compatibility. One example is the StudioPress child themes and others built on the popular Genesis Framework. While this framework includes its own SEO options, if the WordPress SEO plugin is installed, it simply hides all of its own settings and lets the WordPress SEO plugin takeover. This shows a high level of compatibility with this popular plugin and is something worth looking for when choosing a theme or framework. There has never been a better time to be in the market for a WordPress theme. With so many options available, from a multitude of developers, theme shops, and marketplaces, we are more spoilt for choice than ever before. While the feature packed, multipurpose Super Themes™ are still leading the bestseller lists there is a resurgence taking place that is seeing a rise in single-focused, more efficient themes, which are shedding features in place of using plugins. This approach gives site owners back the choice of adding those features to their site at their discretion, and reducing the risk of theme bloat. However, this great increase in choice doesn’t come without its consequences and one is certainly information overload. This can cause choice paradox which in turn can lead to bad decisions being made. 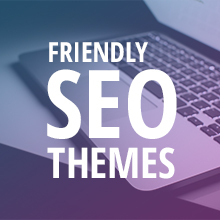 Hopefully this guide to choosing an SEO friendly theme has given you some criteria to use when sifting through the vast number of WordPress themes available today, and can make your job easier when it comes to making the right decision. If you know of any other things to look for when shopping for an SEO friendly theme, or can recommend any specific themes then please leave a comment below.